Hi and welcome to my blog. 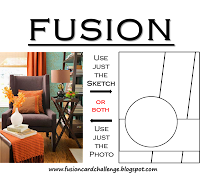 I had some fun today creating, both for design team commitments and for fun. 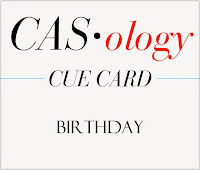 Here is my "for fun" card, which uses the sketch from CAS(E) This Sketch, the birthday theme from ShowCASE Your Style and the masculine theme at Seize the Birthday. I started out with a card base of Neenah Solar White 110lb (just got some and love it for card bases!). I then took a panel of Whisper White and placed a stencil on top before sponging over it using several blue inks from SSS. I tried to keep the center lighter and the edges darkest. Once I was happy with my sponging, I cut the panel in two and adhered it to the card base. 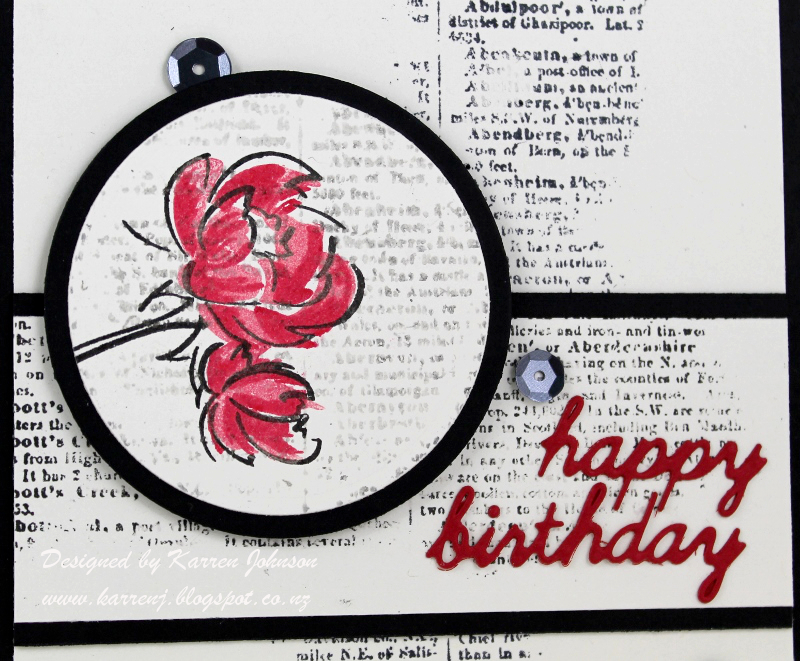 The "Happy" was stamped using archival ink directly onto the stenciled panel and the birthday die is three layers stacked, which was then clear embossed a couple of times to create a raised and shiny finish. All in all, quite a simple card suitable for a male. For my card, I went with a set I've had for a while but hadn't used. It's a cute little set by Lawn Fawn called Flying By. 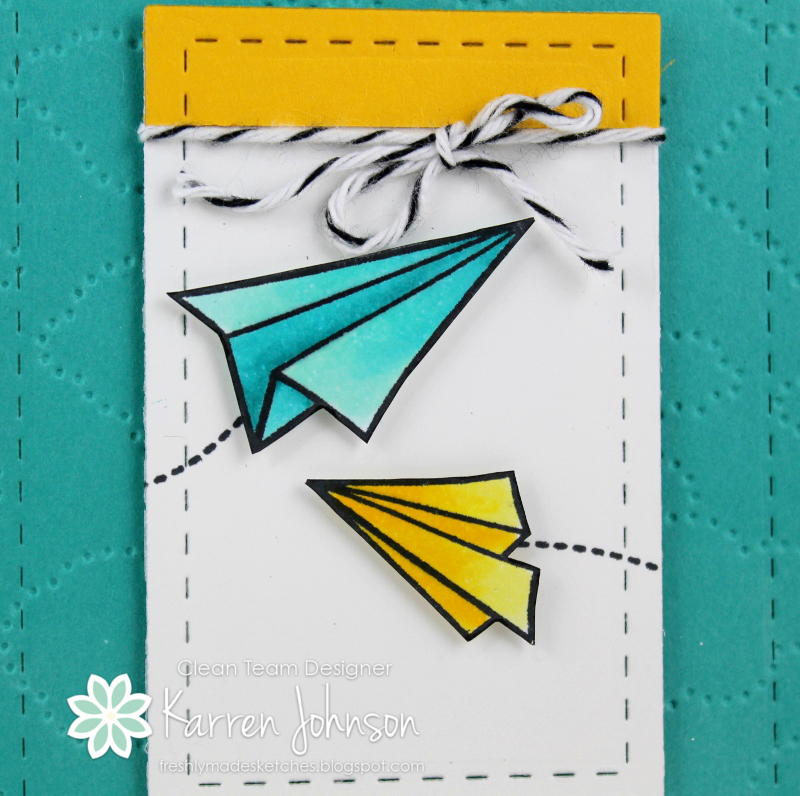 I stamped the paper planes onto X-press It cardstock and colored them with Copics. 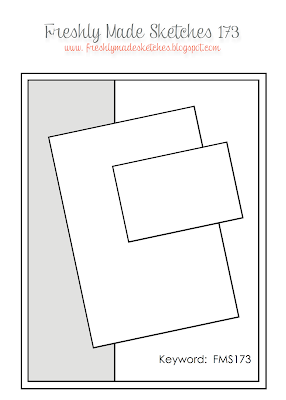 I then cut them out before popping them up with foam tape onto a white panel. At the top of the white panel, I adhered a little strip of Sunshine cardstock. 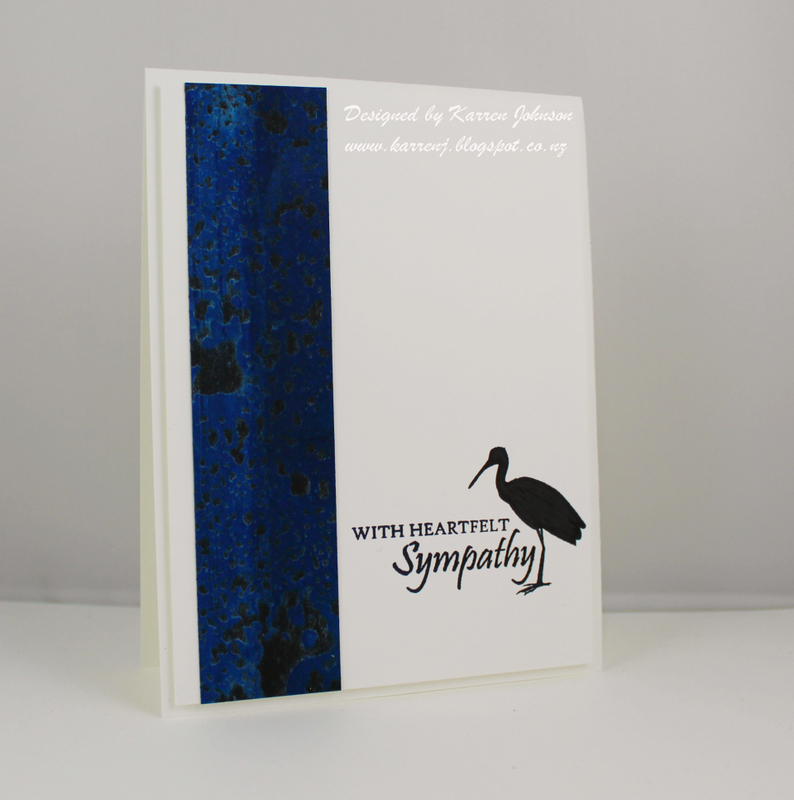 The Bermuda Bay panel is debossed with the clouds embossing folder and the sentiment is white embossed. That's about it for this card. Thanks for visiting and be sure to check out the rest of the design team's cards - they're amazing as always. 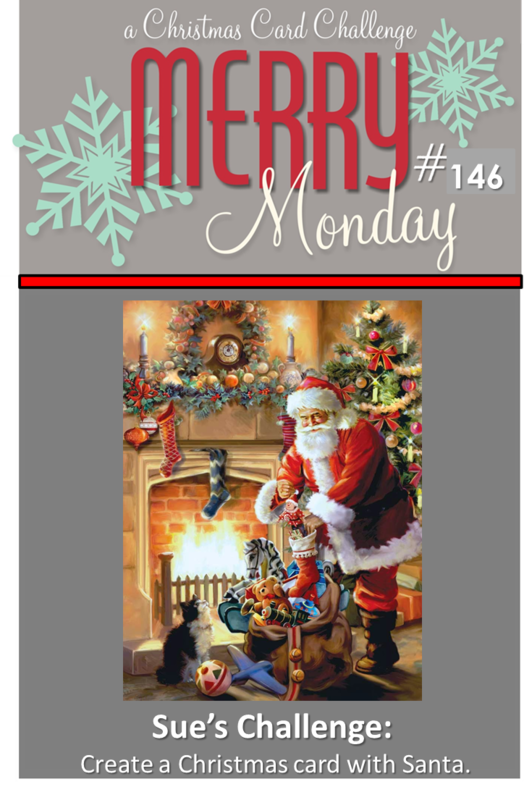 Welcome back for a Merry Monday card! 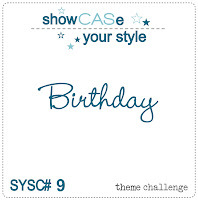 Today's challenge comes to us from Bonnie and her challenge is to use stars on our cards. My card didn't end up as it started and I had a few false starts with it, but finally got something I was reasonably happy with. 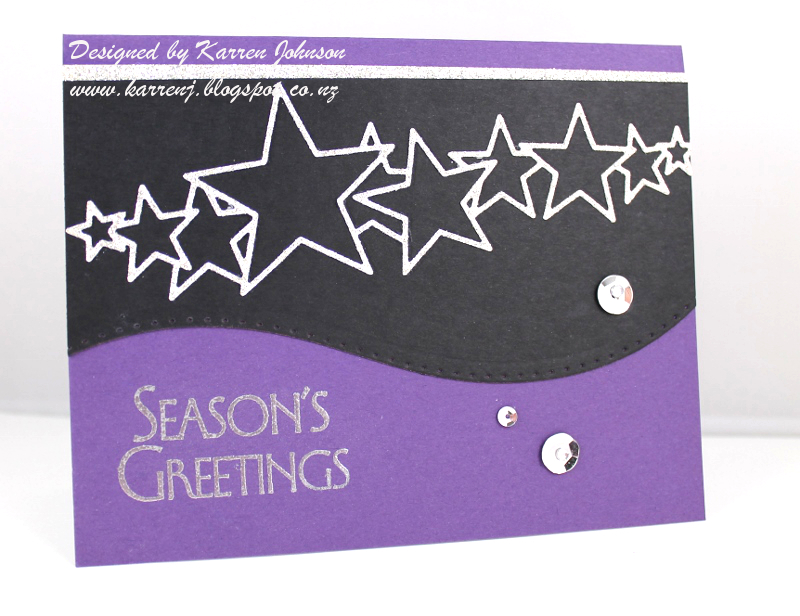 I decided to go with a purple card base for my card and silver embossed the greeting in the bottom left corner. 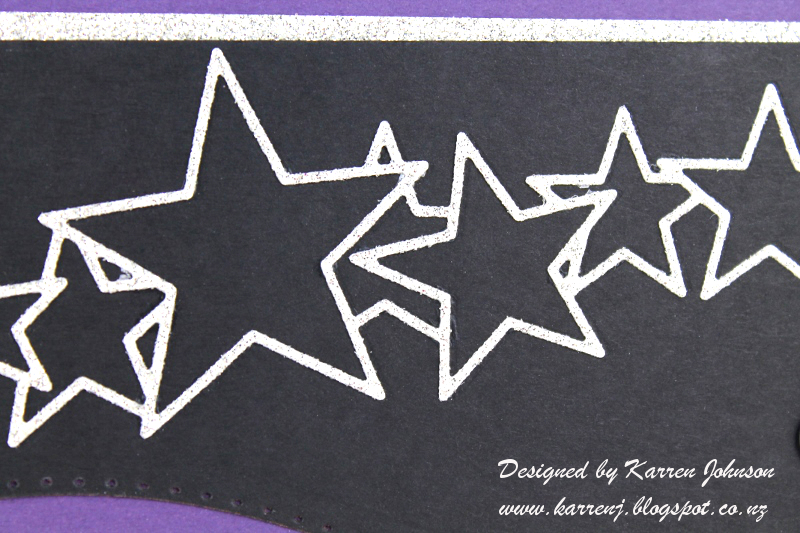 I then die cut the stars using the Stars Parade die and silver glitter paper. I stuck that on a slight angle onto a black panel which had been cut with a curvy edge die. A tiny strip of silver glitter paper at the top and a few sequins and rhinestones and my card was done! Thanks for visiting. The design team have some beautiful star cards so be sure to check them out. 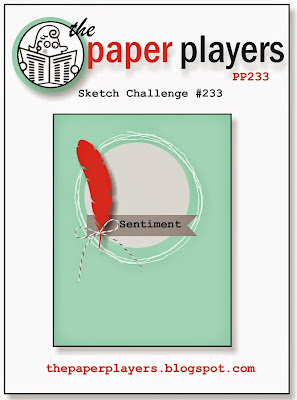 Today's Paper Players challenge comes to you by Sandy and she has a fabulous sketch for you to try. Check it out! I went with a grey and black card and added a touch of vellum. 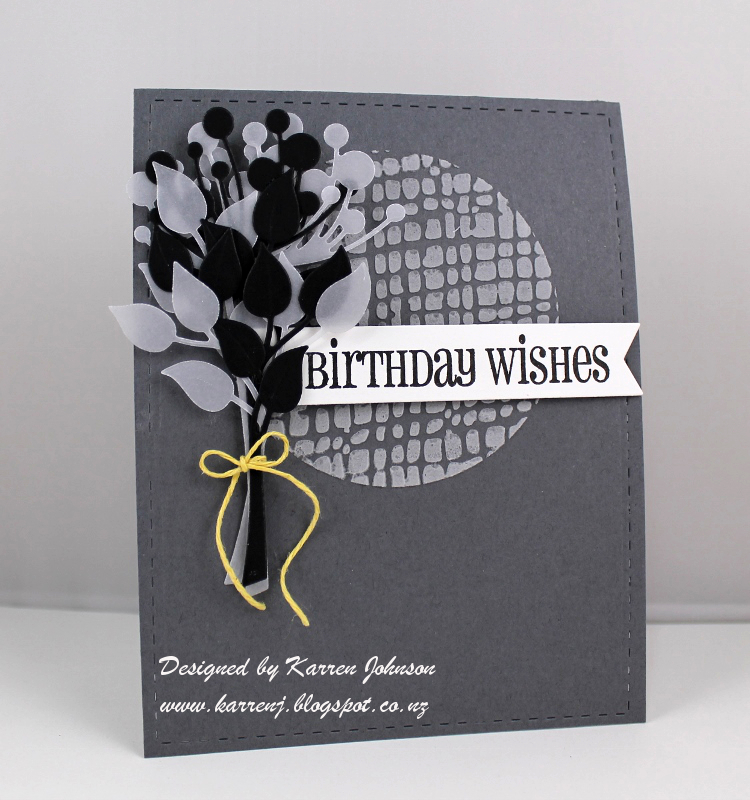 The card base is Basic Gray and I then used a negative circle die cut as a mask and stenciled some Basic Gray colored embossing paste in the center. While that was drying, I created a little bouquet using vellum and black cardstock. I used Memory Box Chloe Stem die and Elizabeth Dies Curvy Leaves. Once I was happy with the arrangement I tied it together with a little piece of yellow twine. 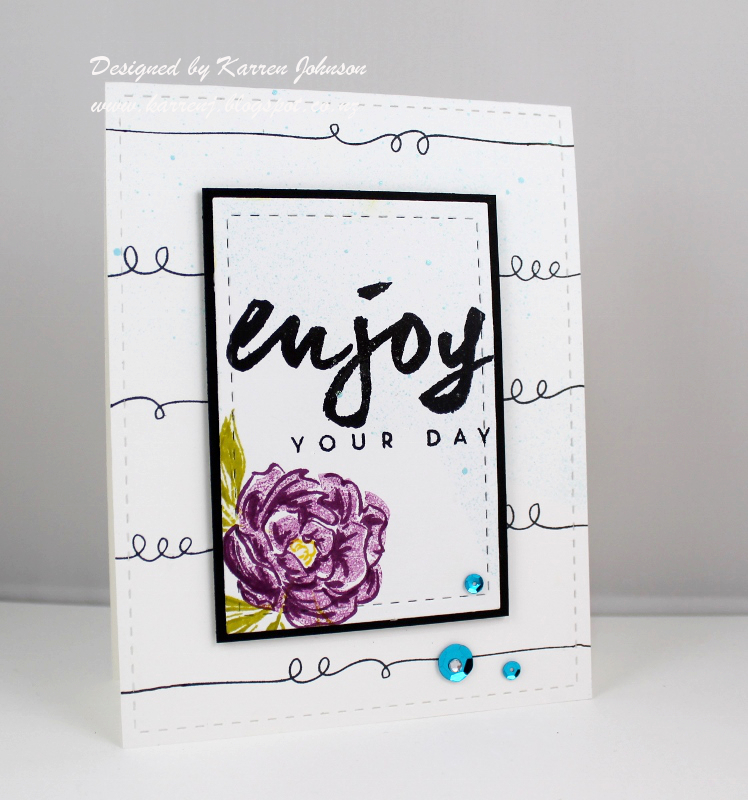 The sentiment is from Say it in Style by Clearly Besotted - one of my favorite sentiment sets. Thanks so much for visiting and be sure to check out how the rest of the design team have interpreted this sketch. I hope you'll give it a go. Hi and welcome to Freshly Made Sketches! This week, Cindy Lovell is our hostess - she who got me hooked on Clearly Besotted stamps with her insane talent - and she has a fun sketch for us. 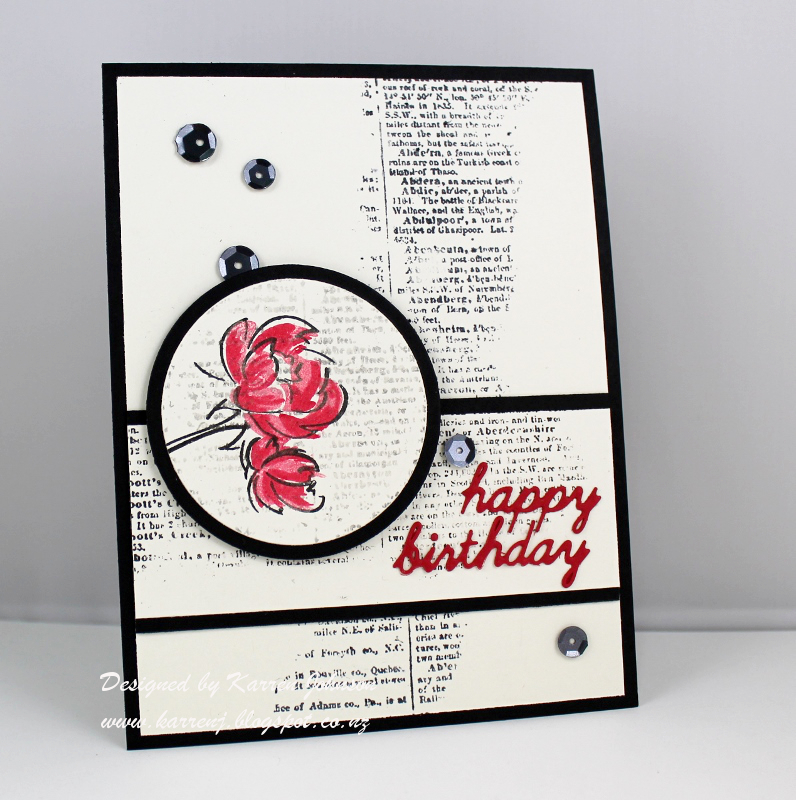 I started with a white card base then cut the Circle Garland die out of black and also out of Tangerine Tango. For the Tango piece I kept the negative and cut it to fit the bottom of the card base. I slightly offset the black positive die cut to add a bit of a white border around the bottom. 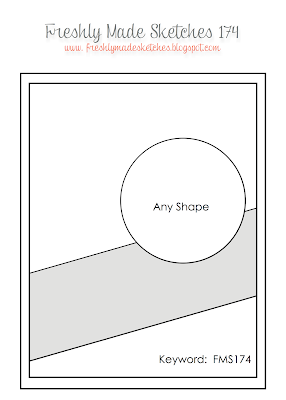 The circle element starts with a black die cut circle, then a vellum stitched circle. I then cut the "for you" from Tag Me Too out of Audrey Blue cardstock and stuck it onto the vellum. I artfully arranged (aka slapped down) some silver thread before popping up the circle element with foam tape. I colored both the words and circle garland die with Wink of Stella. And that's it! The rest of the design team have some wonderful cards to inspire you so be sure to check them out. 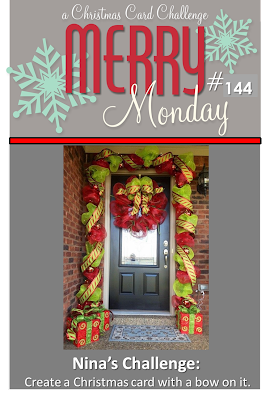 Hi and welcome to Merry Monday! 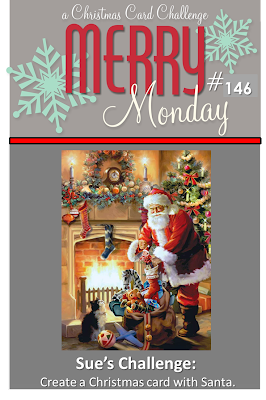 Today's challenge comes to us from Sue and she wants us to feature Santa on our cards. Simple, right? I made this card last year when I first received the cute set Cozy Christmas by Mama Elephant. 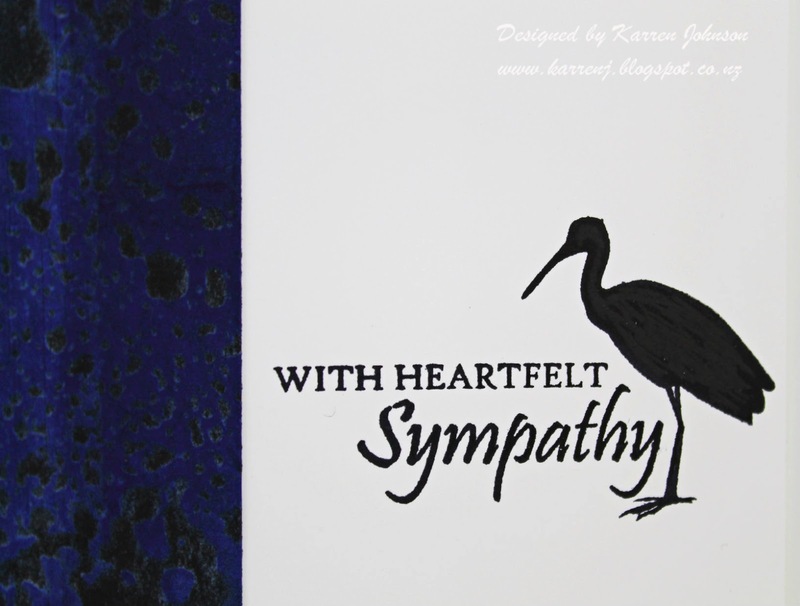 Because I made this card so long ago, I think I sponged Tumbled Glass ink onto white cardstock then stamped SU's Hardwood stamp in Broken China distress ink for my "wall". The tree and Santa were stamped and colored with Copics before being die-cut with the matching dies. 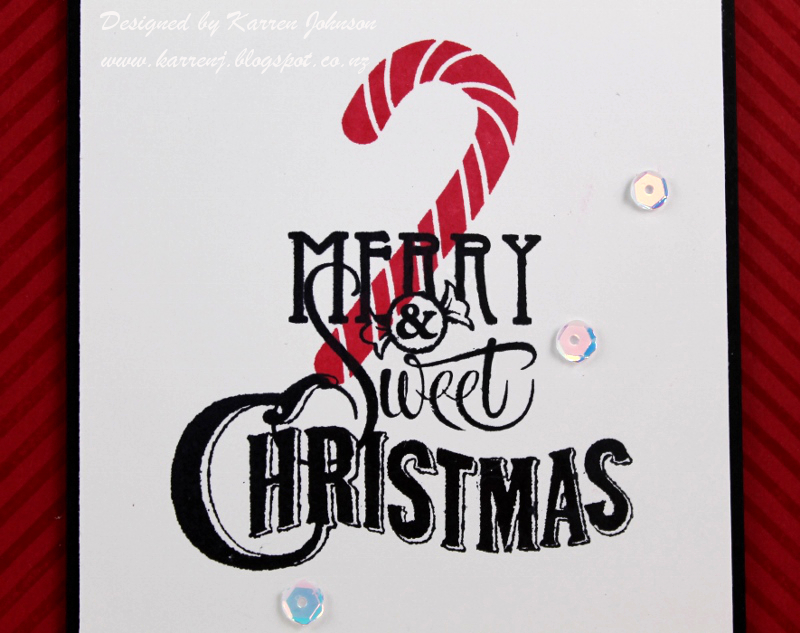 The sentiment comes from Papertrey Ink's Signature Christmas set. 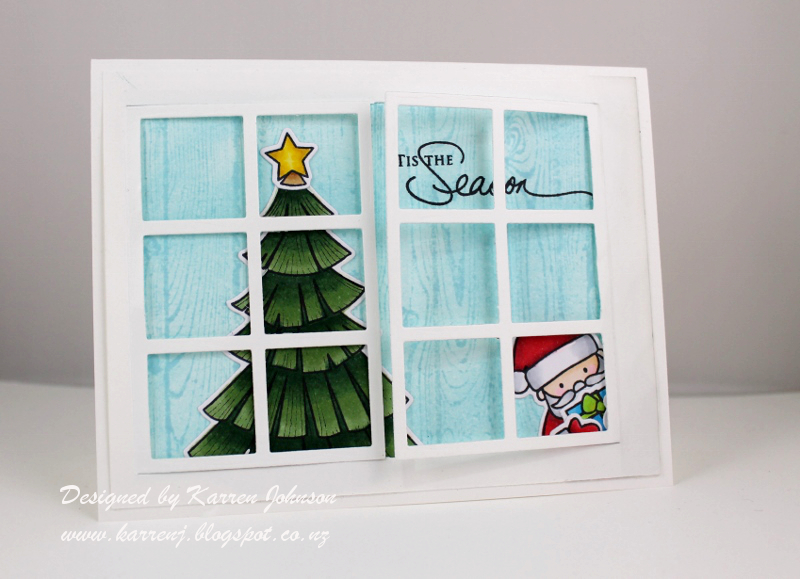 The "windows" were cut with Mama Elephant's Peek-a-Frames die. Thanks for visiting. Check out the Santa cards produced by the rest of the team - they're all amazing! Today's challenge at The Paper Players is to feature a bird on our card. What a great challenge that Joanne has come up with! I started with a white card base and then another white layer 1/4" smaller. On that panel I stamped the heron and the sentiment in Archival Black ink. The blue and black strip came from some sheets of card I've had for well over 10 years and I can't remember how I made them! I know I used the Credit Card Technique and this particular piece started out as black cardstock. I think I used Lumiere Paint as the blue is beautifully shimmery. I'm guessing I put a blob of paint on the black card and used a credit card to spread it really thin so that in some places the black cardstock shone through. I might try and find my Lumiere paints and see if I can re-create this, so that I know how I made it :) Oh the trials of getting old and forgetting things! Accessories: Lumiere Paint(? ), credit card. I used the colors from this week's ColourQ challenge and the sketch from Fusion to come up with this card that I hope she'll like. I took some Very Vanilla cardstock and finger-walked the Dictionary stamp over it to create the diagonal panel as well as the horizontal panel. For the circular piece, I first stamped the peonies then lightly over-stamped the Dictionary stamp with Fog ink to give a very light newsprint background. All the panels were layered onto black cardstock. The sentiment is a die-cut by Spellbinders and I stuck the Real Red piece to some double-sided sticky paper before die-cutting to make it easier to stick down. I wasn't sure about the embellishments, but decided to go with some matte sequins in a dark gray color. Edited to Add: This card got a shout out at ColorQ. Welcome! Today is the first time in two weeks that I've had a chance to make a card for myself, ie not for any design team commitments. And it felt good! 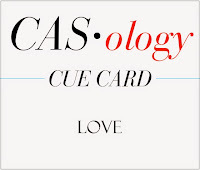 I was a bit rusty at first but came up with this card which uses the "Love" theme at CASology and the sketch at CAS(E) This Sketch. I hope this is close enough to the sketch to pass muster - I took a few liberties with the placement of the sentiment! I used Simon Says Stamp's Ice Cream Dream set and colored the ice cream with copics to resemble orange choc chip - yum! 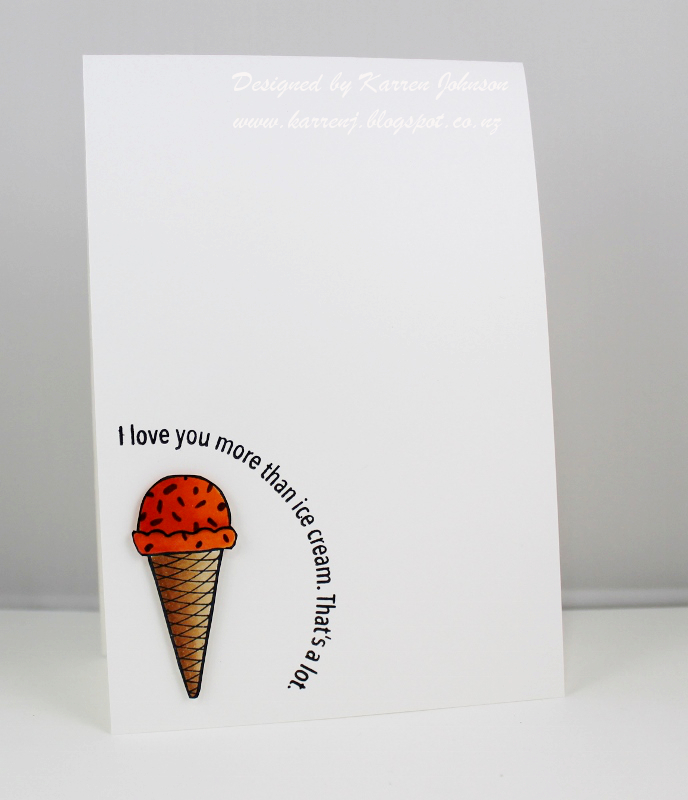 I cut that out and popped it up on foam tape after coloring the ice cream with my clear Wink of Stella pen. 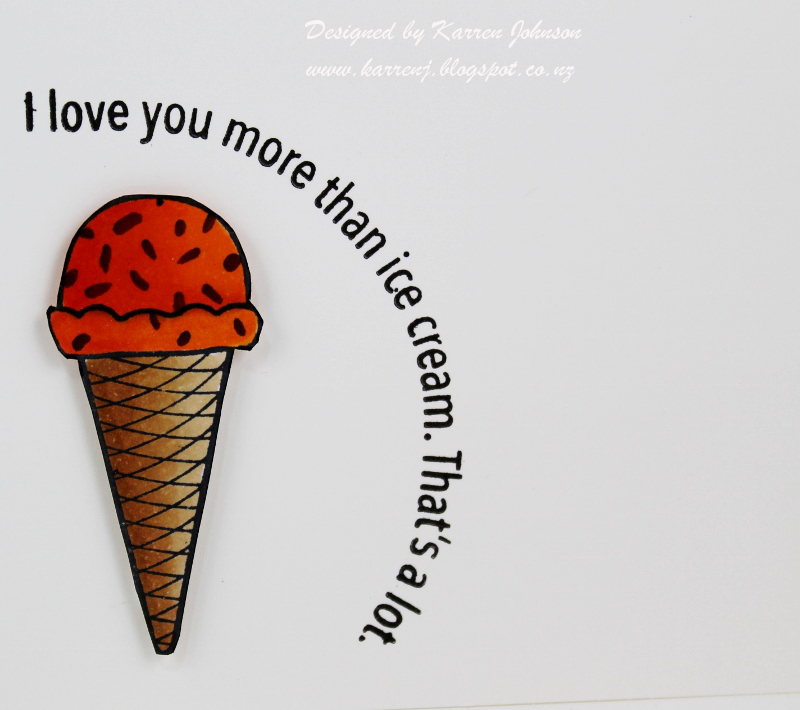 For the sentiment, I die cut a circle and placed it on my Fiskars stamp press. 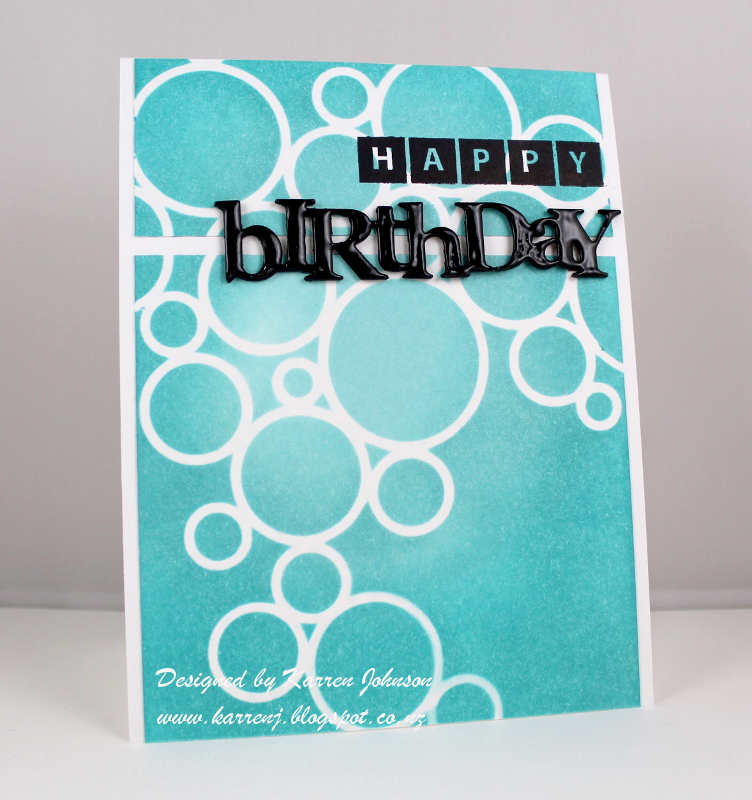 I then curved the sentiment stamp around the circle before removing the circle and stamping the sentiment. To deal with those tilted panels, I went with a little subterfuge with my card. 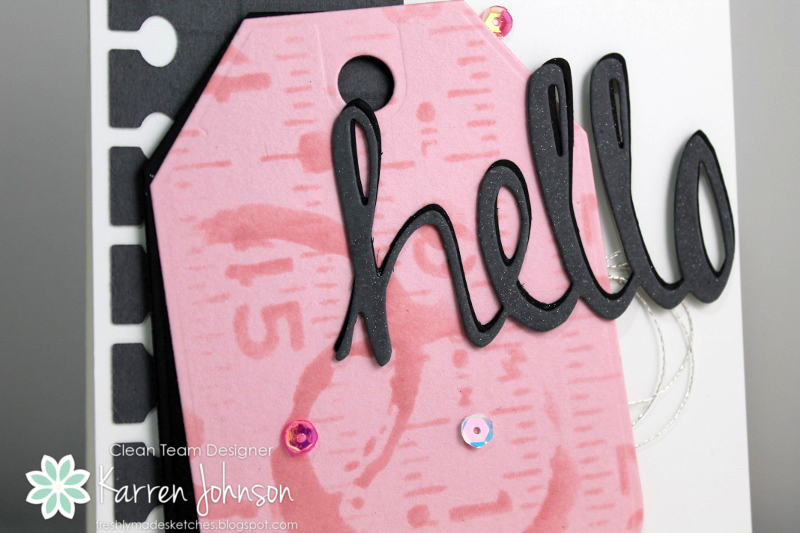 I just got my first order of Reverse Confetti products and used the tag and the office edge for this card. On both pieces, after I die-cut them, I stenciled over them with a sponge and matching ink. I stacked two tags together, slightly off-center and did the same with the word die. I also went over the word with some Wink of Stella to give it a subtle shimmer. 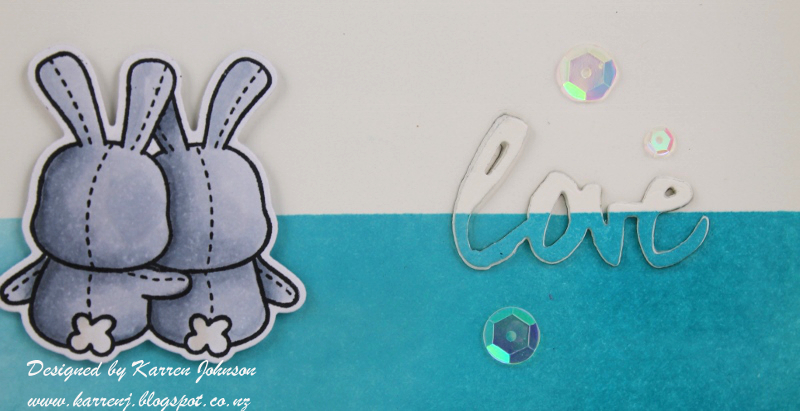 To finish off the card, I placed a few random sequins and a bit of silver thread. Thanks for visiting. Be sure to check out the amazing creations from the rest of the design team. 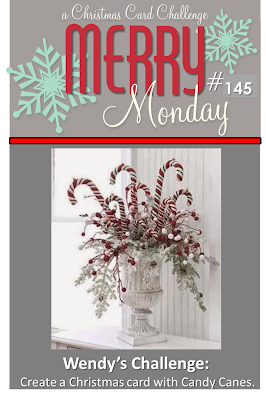 It's Merry Monday Challenge time and this week our hostess is Wendy and her challenge is to use candy canes on our cards. I started with a red card base and stamped a diagonal stripe down each side. 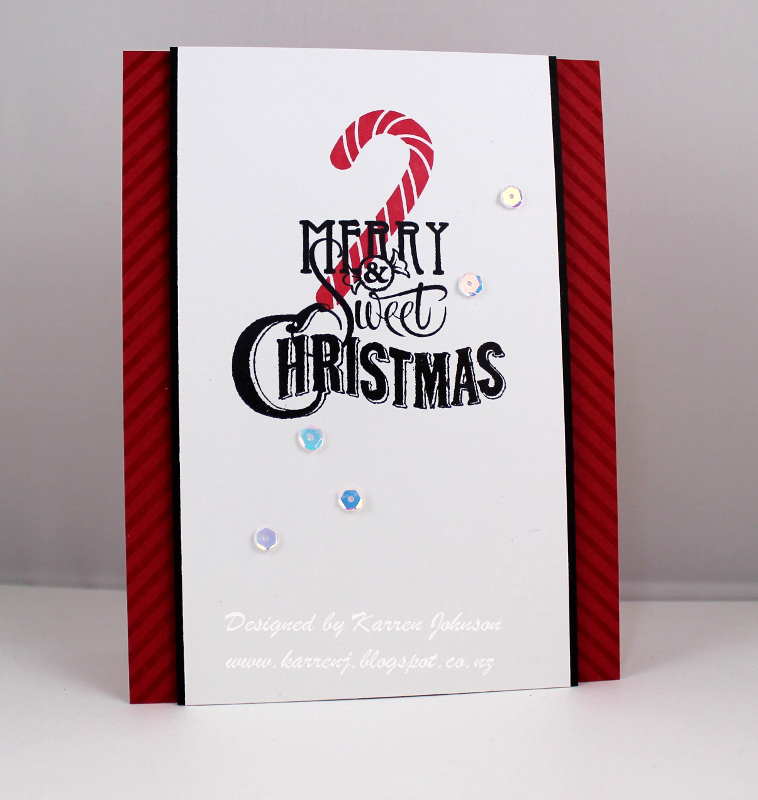 The white panel was stamped with the candy cane then over-stamped with the sentiment. I layered that panel onto a black panel and adhered it to the card base with foam tape. I finished off the card with some sequins and that is that! Thanks so much for visiting. 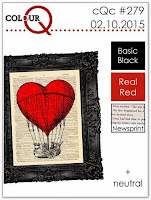 Be sure to check out the inspiration from the rest of the fabulous design team. I decided to get the paintbrush and water out and tried to come up with a watercolored background using Dried Marigold and Barn Door distress inks - the closest matches to Calypso Coral and Real Red. I deliberately tried to water down the red color to give more of a pink-y look. 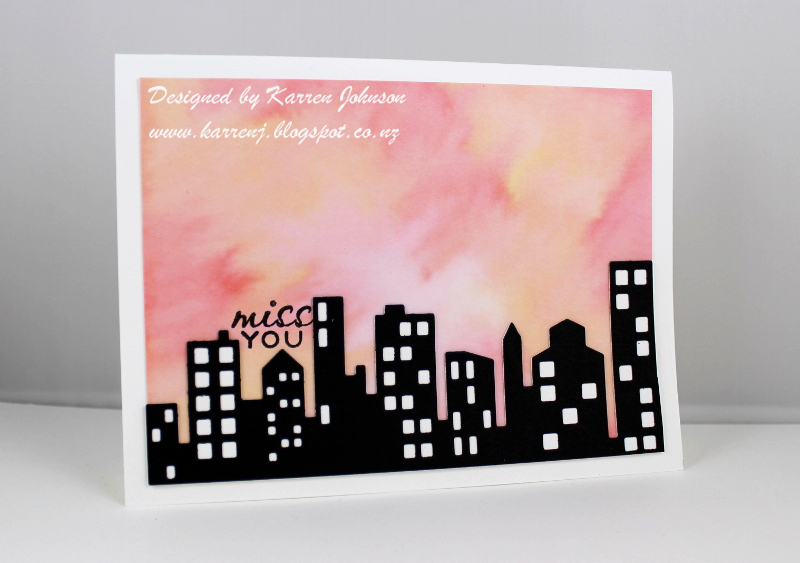 Once that had dried, I die cut the Cityscape Nightline out of black cardstock and the Cityscape Silhouette out of white cardstock and glued them together. Once I had that adhered to the watercolored piece, I stamped the greeting from Communique Curves in black ink. And it's Freshly Made Sketch day again where I join up with my amazing teamies and we show you cards made using the latest sketch - which this week comes from the super-funny and oh-so-very talented Linda Callahan. I went for a card suitable for an adolescent boy's birthday. After stamping the iPhone onto some white cardstock, I cut it out by hand because I haven't bought the dies for this set yet. I stamped the greeting in Green Apple on the "screen" and then decided to emboss the HB2U in Wild Wasabi EP. Luckily they look a close-enough match! The gray panels are popped up on foam tape leaving the strip in the center where the embossed greening is. I used some stamps from Gorgeous Grunge to mimic the shape in the top right corner, then also added some to the bottom left for interest, using Versamark ink for a tone-on-tone look. Thanks for visiting. As always, my team-mates have some amazing and varied cards so be sure to check them out. 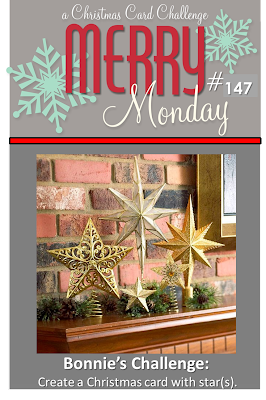 Hi and welcome to Merry Monday Challenge Day! This week Nina is challenging us to use a bow on our cards. It's been forever since I used ribbon on a card, so I decided to use twine on my card. It's hard to tell from the photo but the dark strip down the side of the card is actually green and not black! 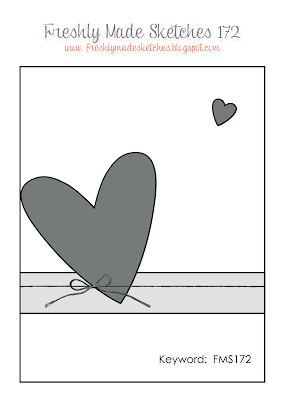 I tied a twine bow around the strip then adhered it to a white card base. I then cut a narrower white panel and stamped the holly branch and sentiment on it before adhering it to the card base with foam tape. I colored the berries with Wink of Stella. And that's about it for this card! Pretty simple. Thanks for visiting. 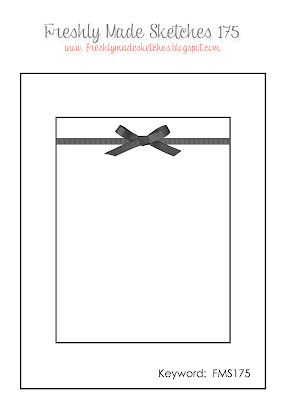 The design team have some wonderful cards featuring bows so be sure to check them out. 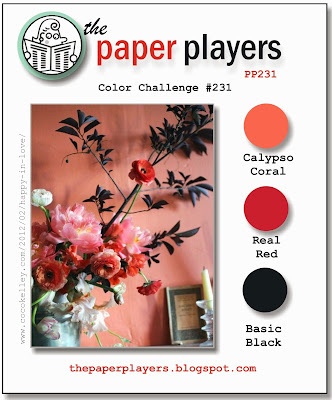 Hi and welcome to my Paper Players post for this week. Claire is challenging us to make a Valentine card to or from our furry friends. 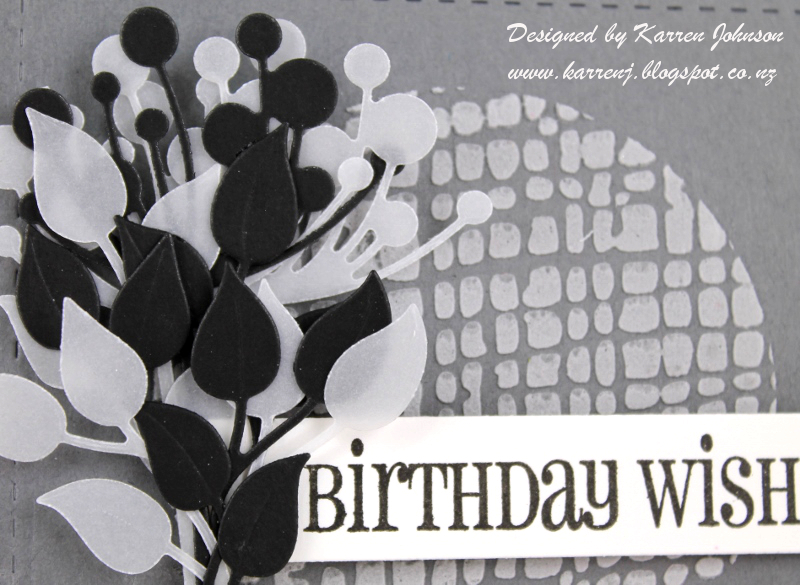 For my card, I decided to try the camouflage die-cut technique as shown by Laura Bassen. But first I have a confession to make. 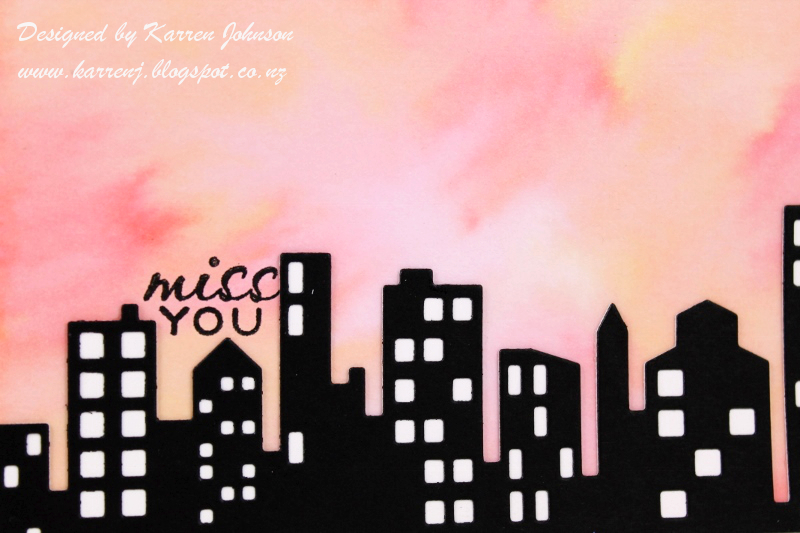 I originally made this card for Jaydee's sketch challenge last week (look familiar?). 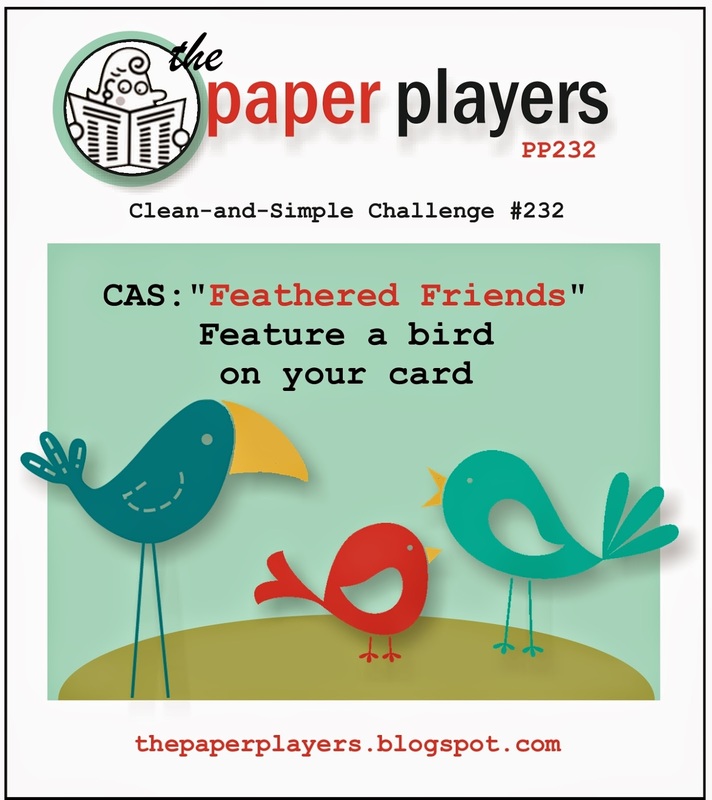 Then when I saw Claire's theme challenge, I decided to use this card for that challenge instead and whipped up last week's card in about 10 minutes! To make this card, firstly I masked off a section of white card and sponged Sea Glass, Maliblue and Audrey Blue in an ombre fashion from left to right. I then die cut the word "love" from Wet Paint dies - once from the sponged panel and four times from scrap white cardstock. I stacked them all up and put them back into the hole. The bunnies were colored with Copics then die-cut and popped up on foam tape. I finished off the card with a few sequins. Thanks for visiting. Be sure to check out the rest of the design team's cards - they're amazing! This card was made for the challenges at CASology, Color Throwdown and CAS(E) this Sketch. It took a while to come up with something for the horizontal lines on the sketch. In the end I used the tails on various stamps in the Handwritten Borders set. 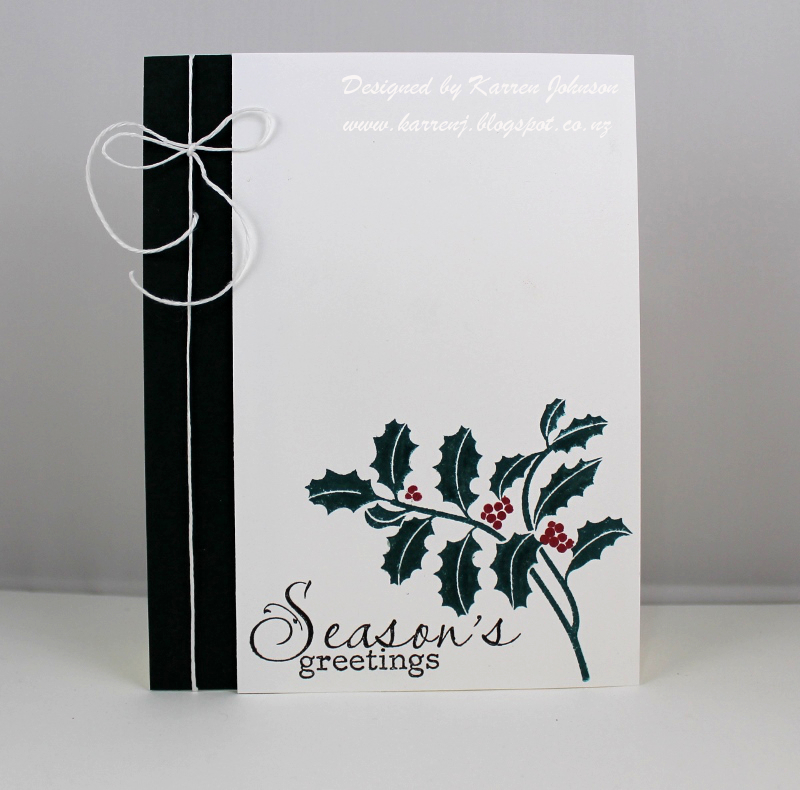 The central panel was stamped with Seedless Preserves, Crushed Olive and Mustard Seed inks. 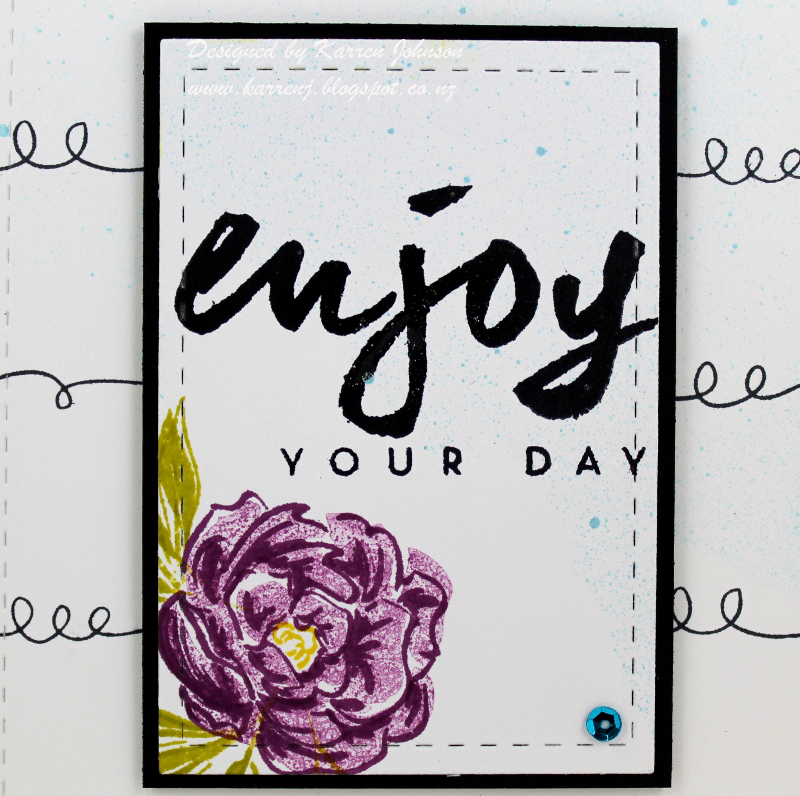 The sentiment was stamped with Archival Black ink and then run through a stitched border die before spritzing with Teal Color Shine by Heidi Swapp. It looks quite subtle in the photo above but I hope you can see it in the close-up below. I also spritzed the card base in the top right corner.